The most important thing I learned in seminary is to come to other people and groups of people with compassion–put more simply–to interpret others charitably. Not only were we future pastors to read our texts and do our best to imagine the author and her perspective in the kindest light, but it behooved us to bend over backward to give the benefit of the doubt to our interlocutors, whether in a theological argument written centuries ago, or contemporaries who engaged in behaviors that seemed anathema at first blush. Having been confirmed by Bishop Curry back in 2009, living and serving (in a lay capacity) in his diocese for 4 years, this is a profoundly appropriate and hopeful image. His determined brow reveals a great deal of joy–a Christian virtue which he does not only express through charismatic preaching and toothed-smile, but also in difficult witness and serious faithfulness. A smile reveals much less about a person than a serious look. There’s a reason that “plastered on” is a phrase used to describe smiles. The truly joyous, the truly vulnerable, they have no need to plaster on a smile for a camera. This is the witness I see in the courageous image above. 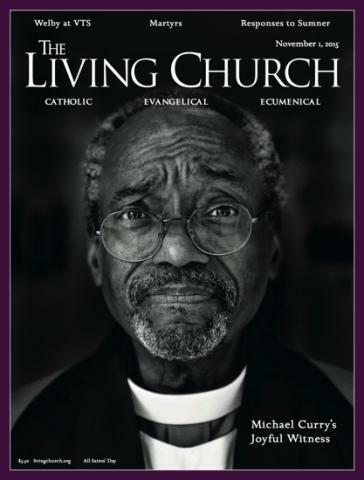 The Living Church has had many iterations and allies over its more-than-centenarian life, and though it’s entered the 21st century with the widest arms its ever enjoyed, there are still those who are caught up with the past, seeking a way to destroy instead of building up the genuine and hard work of reconciliation in which The Living Church has been at the forefront. What if 2 Corinthians 5:17 is really true? What if there really is the possibility of a new creation, and by clinging desperately to old creations, we ourselves–our interpretations–are denying God’s transformation? What if we are stuck in our old ways, unwilling to see the new things that God is doing, even through a publication that’s been around for a long, long time? I’m not very good at this sort of discipline–giving others the benefit of the doubt–I’m much more wont to get defensive and put up walls to keep myself from getting hurt, instead of following the example of our Lord and resting safe in the knowledge of God’s provision and ultimate protection. It is in weathering storms that we are united to Christ in his suffering and it is in standing still, allowing God to fight for us, that we are brought to resurrection and new life. This entry was posted in church, community, Confession, Resurrection and tagged 2 Corinthians, charity, compassion, conversation, dialogue, The Living Church by Emily. Bookmark the permalink. Amen. These wise words call to mind Psalm 46:11 “Be still and know that I am God; I will be exalted among the nations; I will be exalted in the earth” I believe our brother Michael has been called to special purpose, and an urgent one. For he knows well that “weathering storms” and “allowing God to fight for us” is the only way we are brought to “resurrection and new life.” Thank you for these thoughts.